My neighbor stopped by last night and gave me a bunch of summer squash from his garden...a lot of squash! I'm not certain what I'm going to do with it all, but I guess zucchini bread, fritters and pickled squash are in my near future. Too bad that I don't like the taste of squash in my morning juice--I just find it to be too bitter. In any case, I was very appreciative and will use up every bit of it. Nothing like fresh produce from an organic garden right next door! In a small sauce pan on medium heat, add 1 tsp extra virgin olive, couscous and toast until lightly golden brown, about three minutes, stirring constantly to prevent burning. Add 4 cups water and 1/2 tsp salt and cook for about 10-15 minutes until couscous is soft. Drain couscous and rinse under cool water and drain again really well. Place in a medium bowl and chill in the fridge until ready to assemble. Shuck corn and cut kernels from the cob and place in a bowl. You should have about 2 cups corn. Dice squash around the same size as the corn kernels and set aside in another bowl. You should have 3-4 cups diced squash. Heat a large saute pan on medium-high heat and add a little bit of olive oil. Working in batches (you don't want to crowd the pan to avoid steaming) cook squash and corn separately for about 3 minutes or so until lightly charred, adding more olive oil when needed. You don't want to overcook the vegetables, they should be crisp-tender. Once cooked, place vegetables on a sheet tray to cool. Slice tomatoes in half or quarter depending on size and add to couscous. Next add in zucchini, corn, chopped basil, toasted pine nuts and stir to combine. Season with lemon juice, salt and black pepper to taste and chill in the fridge for at least an hour before serving. Check seasoning again before serving. 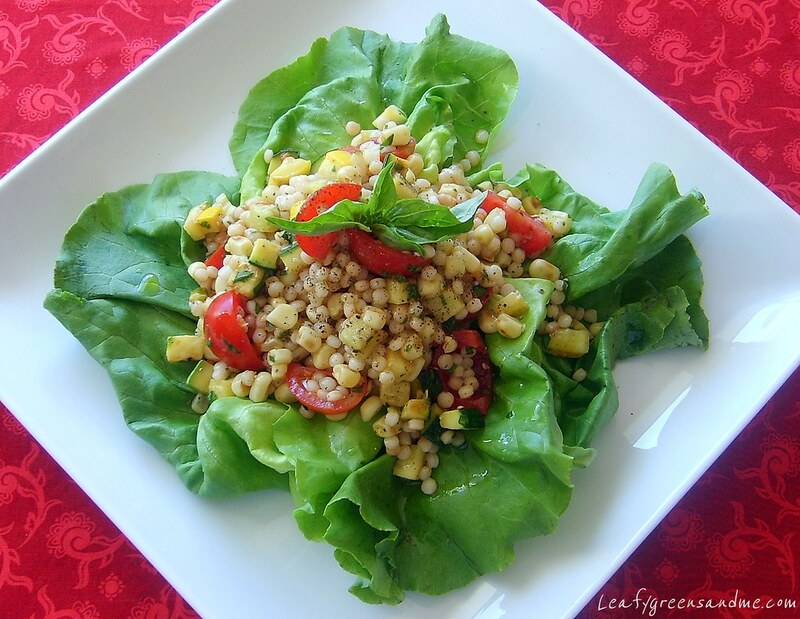 Serve on a bed of lettuce, sliced heirloom tomatoes, or as a side dish to your favorite entree.